Bentley’s Batch 5 Sweet ‘N Heat Barbecue Sauce is the same as the original that my Dad taught me how to make over 40 years ago, except we added some sweetness and heat to heighten its flavors. It’s still a Worcestershire based barbecue sauce with the same bold zesty flavor as our Reserve Barbecue Sauce. And just like our Reserve, it’s tangy and rich with small bits of tomato, onion and peppers. And our Sweet ‘N Heat combines the perfect blend of sweetness with just the right amount of heat to enhance whatever you’re cooking. You’ll still taste the wonderful flavors of Bentley’s Batch 5, but we won’t be surprised if our Sweet ‘N Heat doesn’t become your favorite barbecue sauce. Our Sweet ‘N Heat Barbecue Sauce can be used as a cooking, finishing or dipping sauce or just slather it over your cooked meat or seafood dishes, and it also goes great on vegetables. 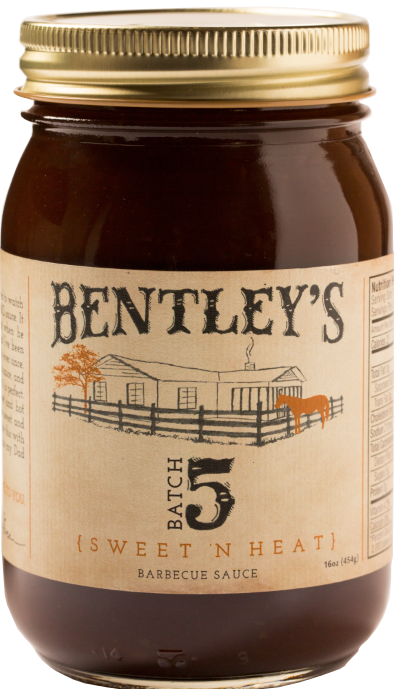 Bentley’s Batch 5 Sweet ‘N Heat Barbecue Sauce will enhance the flavors of your perfectly cooked meat. And it’ll save the day when what you’ve cooked isn’t quite perfect. When you spend all day cooking, you deserve a special barbecue sauce. You deserve Bentley’s Batch 5 Sweet ‘N Heat Barbecue Sauce.